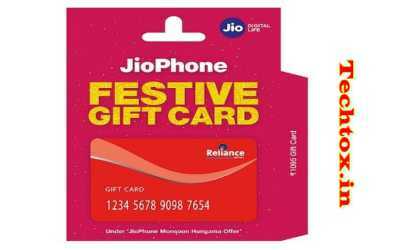 Telecom company Reliance Jio has introduced a new Jio Phone Gift Card. This is for those who want to buy First Generation jio 'Smart' feature phones under the jio Phone Monsoon Hungama Exchange Offer. The cost of this gift card is Rs 1,095. Remember that under the Jio Phone Monsoon Hungama offer, users can exchange their old feature phones with the new Jio Phone for Rs 501. The number of remaining Rs. 594 will be used as a jio Recharge pack of Rs. 99. Let us know that Jio Phone is sold in India for Rs 1,499. This amount is a security deposit which will be recovered after completion of three years. According to Gadgets 360, the new Jio Phone gift card is available in Amazon.in and the Reliance Digital offline store. According to the Amazon listing, the jio Phone gift card cannot be refunded or refunded. If seen, the Jio Phone Gift Card of Rs 1,095 has been presented as a Diwali gift. Under the Jio Phone Monsoon Hungama exchange offer, 2G / 3G / 4G phones, less than 3 years old, can be exchanged in jio's authorized retail outlets. Exclusive offer for jio Phone, the jio Recharge pack of Rs 99 will get unlimited local, STD and roaming calls. Apart from this, 500 MB 4G data is given every day for use. In this validity of 28 days, a total of 300 SMS is available free of charge. Apart from this, the subscription of jio Apps is free. With an amount of Rs. 594, the customer will be able to recharge a 6 after one of the packs. Apart from this, Gift Card comes with 6 GB free exchange bonus data voucher. In this way, a total of 96 GB of data is available for use. Apart from this, there are two more exclusive Recharge packs for Jio Phone. The initial pack is of 49 rupees. In this, the user gets unlimited calls, 50 SMS, 1GB data and free live subscription of jio Apps. Recharge pack of unlimited voice calls of Rs 153 is available. For every day use 1.5 GB 4G data and 100 SMS. This pack also offers a free subscription of jio Apps.